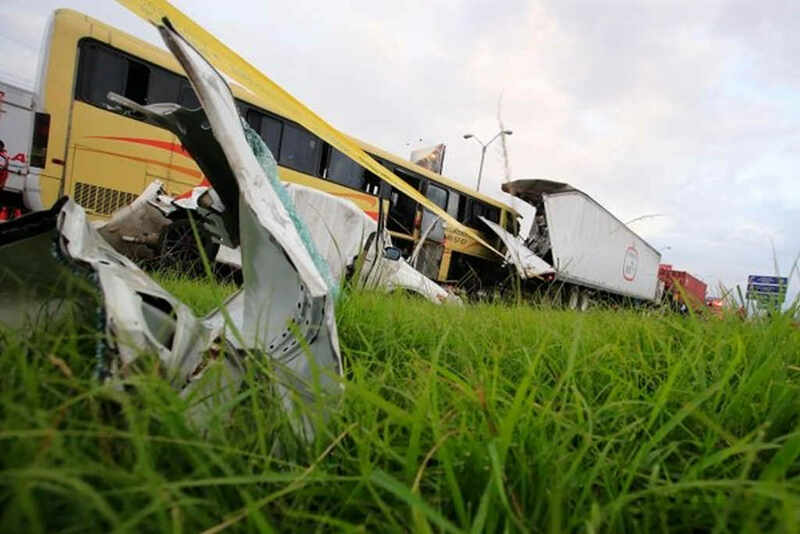 The bus driver of the Atenas-San Jose route that collided last Friday against a car and a trailer, and in which a 13-year-old girl and her stepfather died, will have to comply with a series of precautionary measures. For reasons yet unclear, the driver of the bus changes lanes, runs the white sedan off the road and slams into the back f a tractor-trailer on the Autopista General Cañas on Friday. Two people died in the accident, dozens more injured. The man, whose last names are Solórzano Barrientos, will not be able to leave the country for a period of two years, and will also be unable to drive during the period during the criminal proceedings against him. The San Joaquín de Flores Criminal Court in Heredia imposed the measures against Solórzano who faces two counts of negligent homicide. The fatal crash occurred last Friday, around 4:12 pm, in from the Nissan company on the Alajuela bound lanes of the Autopista General Cañas. At the time, the bus driven by Solórzano was in the middle lane while the white Honda Civic with the two victims and two other passengers was in the right lane. A tractor-trailer was stopped in the right lane waiting to exit to Belen. According to witnesses and preliminary findings, the Solórzano changed lanes, moving to the shoulder lane, forcing the Honda off the road and into a cuneta (ditch). Two of the occupants of the Honda, Jose Adrian Oreamuno Alfaro, 34, and his stepdaughter (whose name cannot be released for she is a minor) died on site. The young girl’s mother, Jenny Gómez Araya, 41, is clinging to life at the Hospital Mexico, while her 17-year-old brother is recovering at the Alajuela hospital. The four were returning home from the 13-year-old’s sixth-grade graduation that was held at the same school her mother was a teacher. According to Transito (traffic official), Yenner Piedra Zúñiga said on the day of the crash, “By moving over to the right (the bus) ran into the sedan and hit it first; then it hits the back of the trailer. The minor was extricated from the vehicle and died inside the ambulance at the scene”. The Bomberos (firefighters) had to use the jaws of like to extract Janny Gomez from the twisted metal, as well as her 17-year-old son, who was traveling in the back seat. A total of 29 passengers on the bus were treated with cuts and bruises, several of them had to be taken to hospital, four in serious condition. Authorities did not give more details on the condition of the bus driver, if he was under the influence of alcohol or drugs or what could have caused the driver to change lanes.